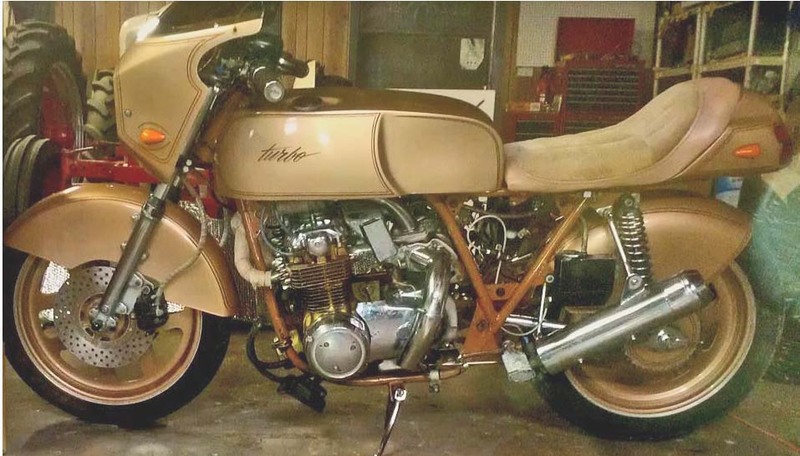 Here is an email I received from this old fella and thought I would share it with you, maybe someone can help the bloke out as this is a cool old piece of Cafe Racer History in the states. Right now I am trying to get my workshop organised as I have moved so I don’t have time, but am sure some one can help Fred out.? Attached is a picture of my bike along with copy. My problem is that in 1978 I crashed the full faring bike, moved to northern CA, then moved back to Redondo Beach in 1980 and found a fellow to design and work on the bike. Unfortunately it took him until 1999 to complete the design and it would not run. Originally it had a RayJay turbo and ran great on the 500 Honda bored to 550 CC. Even though the turbo was modified it would not begin to pump until third gear as it was too large for the engine. 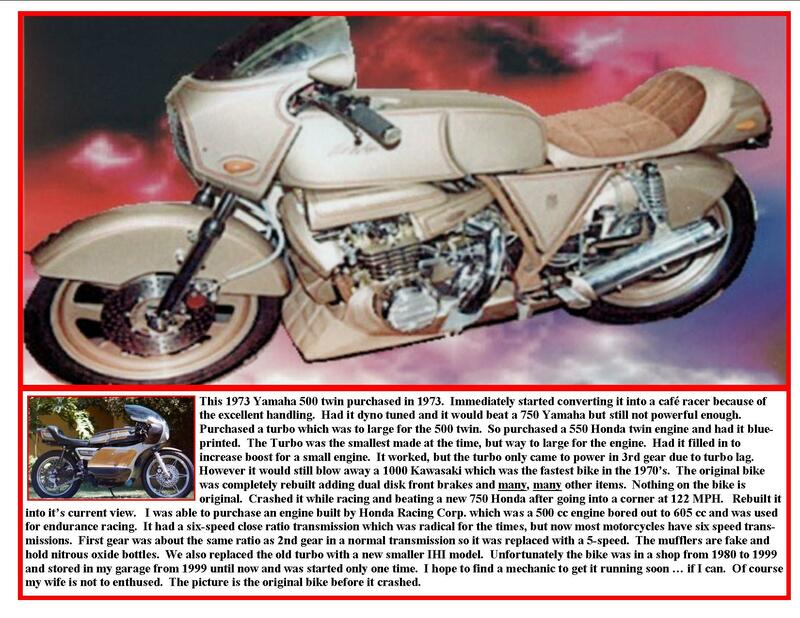 In the 1990’s I found a Honda racing 500 engine produced by Honda Racing and was bored out to 605 CC and raced on the tracks in the late 70’s and early 80’s. It had a 6-speed close ratio transmission and first gear had a normal ratio of second gear of a standard transmission. I traded it for a stock transmission which was without a starter. I then purchased a new small IHI turbo built specially for small motorcycle engines. But the builder could not get it to running. I then stored it in my Palm Springs (Palm Desert) home for 11-years in the heat which damaged parts. Then I found a person who was supposedly a turbo expert in Huntington Beach to repair it. He kept the bike for almost 3-years and after 1 ½ -years could not be found. I had to call the police to locate him. He finally gave a full report which was not totally accurate as to my recommendations. His report is attached. (I WANT TO LIMIT THE EXPENSE TO NO MORE THAN $2,500 IF POSSIBLE). I have a ton of money invested in this stupid thing and am 74-years old and want to get it running and then possibly auction it off or sell it. Attached in MS Word is the repair person’s estimation of needs for the bike. I paid him in advance for much and got only carb work and but I was very patient and darn nice through the whole situation, never saying a foul word only resorting to police action as I feared that he may have closed shop and sold the bike as he had not responded to phone calls and emails in over 1 12 –years.